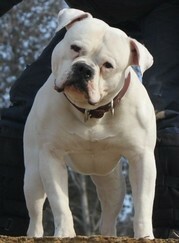 Here at FaithFullBull the American Bulldog has been a real passion for years. We are a little kennel in the country, not too far from Trois-Rivieres in Quebec. All our dogs live in the house with us, and have access to a big 100 x 160 ft fenced yard where they can run and have fun everyday. Our breeding program is based on functional bulldogs, that are able to work, that are athletic, mentally sound and of course healthy. We show our dogs everywhere in North America, USA-Canada included. We have a Champion an a Dual Champion in our yard. We are very involved and have a lot of success in all kind of sports with them. 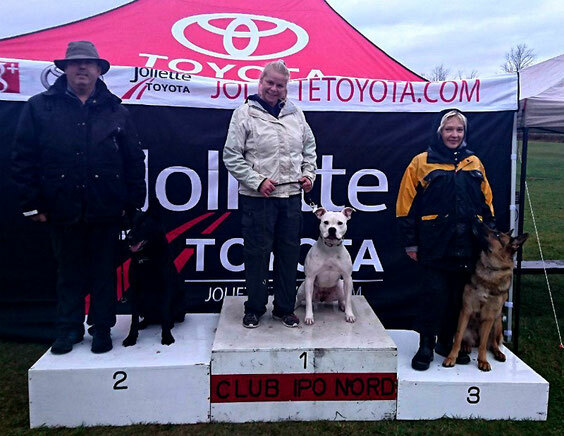 We are member of the GSSCC and member of the IPO Nord Schutzhund Club. Of course most of our dogs are titled workers, 4 are IPO titled! Our Bulldogs are registered with the ABRA (American Bulldog Registry and Archives), with the NKC (National Kennel Club) and UKC (United Kennel Club), which means that they are purebred, with a pedigree full of conformation and working titles. Our reproducers all have their hips and elbows tested with xrays and they are certified by the OFA (Orthopedic Foundation for Animals), the PennHip (Pennsylvania) in USA and/or the OVC (Ontario Veterinary College) in Canada, to make sure our dogs are ok to be bred and don't have any genetic disease/anomaly, such as hips dysplasia. It is very important for us that the xrays/tests are certified by a well known organization, and that way we can also make sure we can keep track of our productions' results as well as all the ancestors that have been tested in our dogs' pedigrees. We also test, with DNA sample, all our dogs for NCL (Neuronal Canine Ceroid Lipofuscinosis Basics) and Ichthyosis, genetic diseases in our breed. All our puppies will be registered and sold with A.B.R.A /N.K.C papers, photocopies of health tests of both parents, guaranteed for 2 years for genetic diseases, including dysplasia in the hips and elbows, examined by our veterinarian, vaccinated, de-wormed and will have their Health Record Book. Faithfullbull is a kennel registrated by American Bulldog Registry and Archives.